I’m quite surprised that I don’t blog about the main subject that takes up most of our home edding days: Quran and Hifdh. Well, in time for Ramadhan, I thought I would share what we do for Quran and hifdh. I think most Muslim home edders pay a lot of attention to teaching their children how to read Qu’ran and also memorisation of Allah’s Book. As they don’t have the constraints of school hours, there is a lot more time that can be devoted to Qu’ran alhamdulillah. And in fact, I have met quite a few home edders who have pulled their children out of school for 2 years to help their children memorise the entire book of Allah – some then continuing with home ed and others placing their children back in school. Qu’ran plays a huge role in the Ummihomeschoolsme household. Like most new parents, we started teaching R hifdh from when she was 2.5 (shock!) and she has been memorising ever since masha’Allah. Babies, house moves, going abroad, illnesses etc have broken our dream of her memorising Qu’ran by the age of 7 (she’ll be 8 soon insha’Allah) but alhamdulillah such is life. We sat down with R a few months ago and had a serious conversation about her hifdh. We gave her a choice – either she can memorise slowly and aim to complete her hifdh in her late teens or she can aim to consolidate it by age 10-12. My husband is a haafidh mashaAllah and so she knows and sees the commitment he still needs to give to the Qu’ran – many years after completing it so as not to forget. She knows that in order to complete her hifdh in a few years – it is going to take up A LOT of her time and she will have to make sacrifices. We left the thought with her and she came back to us deciding to go for it mashaAllah. So, the last few months have been spent consolidating the few ajaza (I think thats the plural of juzz) that she has memorised in preparation to start her new program in Ramadhan bi’idnillah. Everything that she has memorised has been split up over the course of a week – the more she memorises insha’Allah – it will move to everything over 2 weeks, then to 3 weeks, and then to a month. WEEK 2 – she prepares for 30 mins as above and then I will test her by reciting any ayat on her portion of surahs for that day and she has to continue til I say stop – again, noting down any mistakes. WEEK 3 – same as WEEK 1. HIFDH TEST – Each night, I then test her on the hifdh she did in the morning. END OF THE WEEK – She is tested on all her new hifdh for that week. She also reads the next juz that she will memorise repeatedly until she begins memorising that juzz. Once she starts that juzz she will read the preceding one so as to prepare her for when she comes to memorise insha’Allah. I play the surah she is currently memorising and the next surah she will memorise in the car continuosly and repeatedly. I play it in the house when they are playing or doing something that doesn’t require a lot of attention. We encourage her to make a lot of dua for herself and istighfar. This is what works for us. It means doing Qu’ran for about 3-4 hours per day but insha’Allah I hope that by spreading it out throughout the day that it becomes easier for her. I hope this plan has helped some of you – please do share your own plans and I ask you to please make dua for my R, that Allah grants her the tawfiq and honour of memorising His Book but most importantly that she grows into a young woman who lives by it. Ameen. Alhamdulillah, last night I hosted the annual eid gala event for revert2reality. All the sisters had a blast last night mashaAllah. It is for reverts and the local east london community and there were quite a few homeschooling sisters I know who attended. It is REAAAAAAAALY cold at the moment. The kids have been ill. I’ve been a little ill and then hubby has been ill. Just that time of the year. These days I don’t feel like going out unless I really need to. We go to our local home ed group on a Thursday, but I’m pretty much quite happy to stay home most of the week and do stuff with the kids. I don’t really do ‘cold’ weather. Holes were made 3 cms apart all around the rim. It was then left to dry. 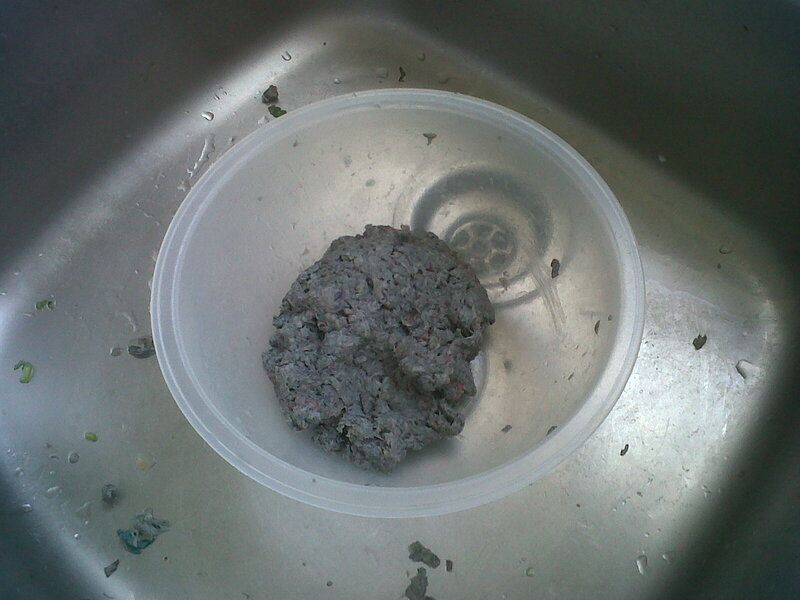 And she began to fill it with the paper pulp til it was about 1cm thick. 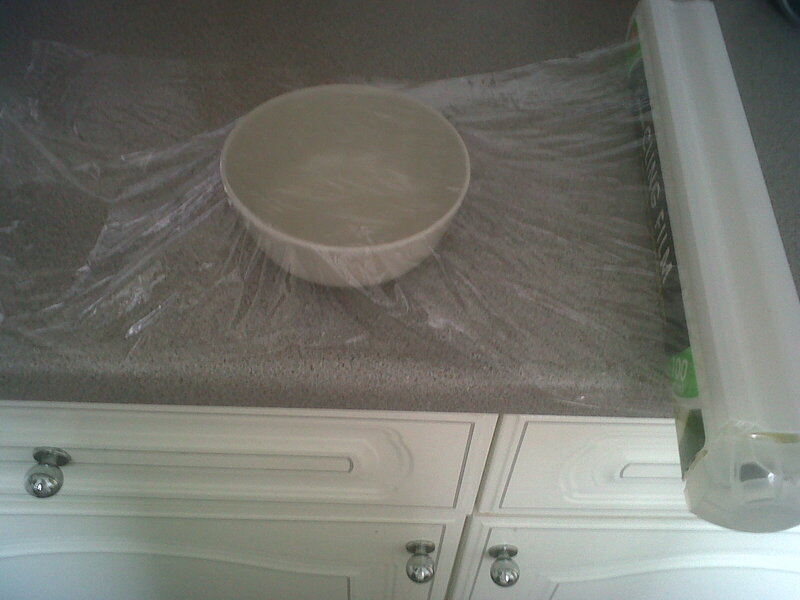 We then covered the inside of a bowl with cling film. 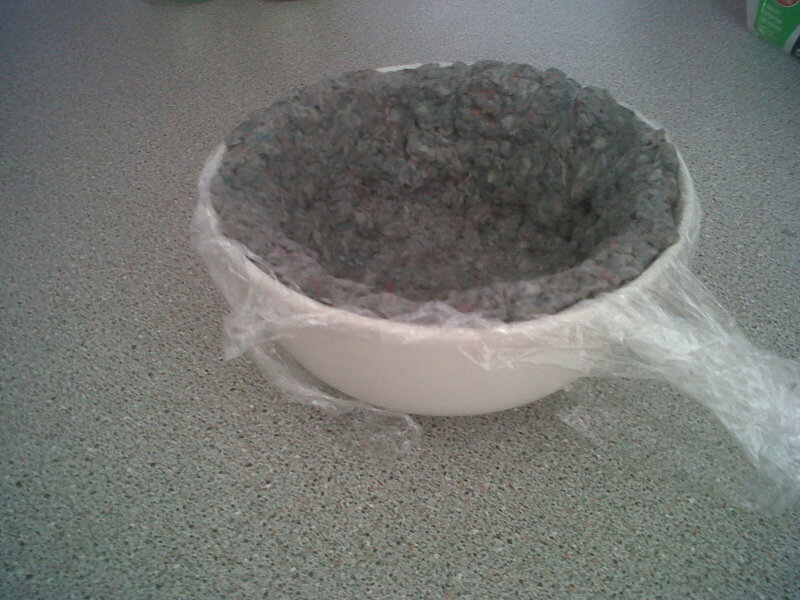 For Art, we have started a papier mache project. 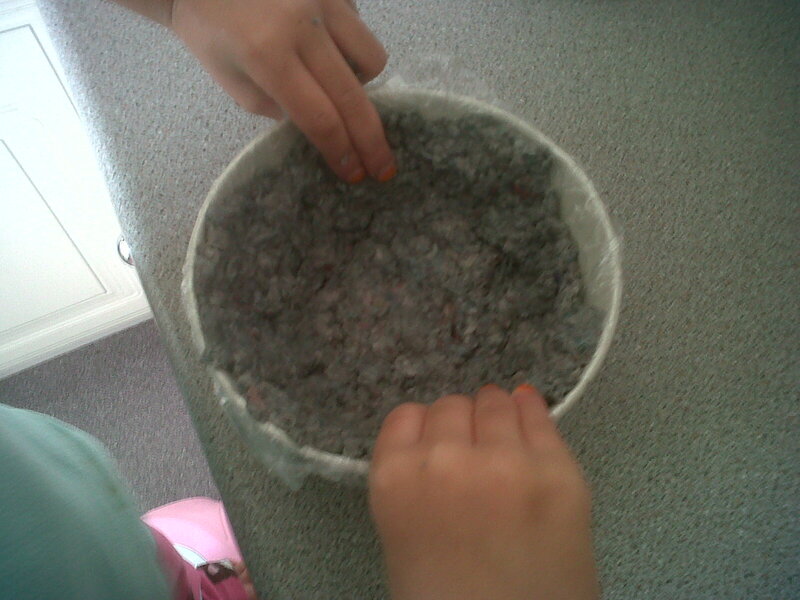 This is R making paper pulp. Z made this fish. 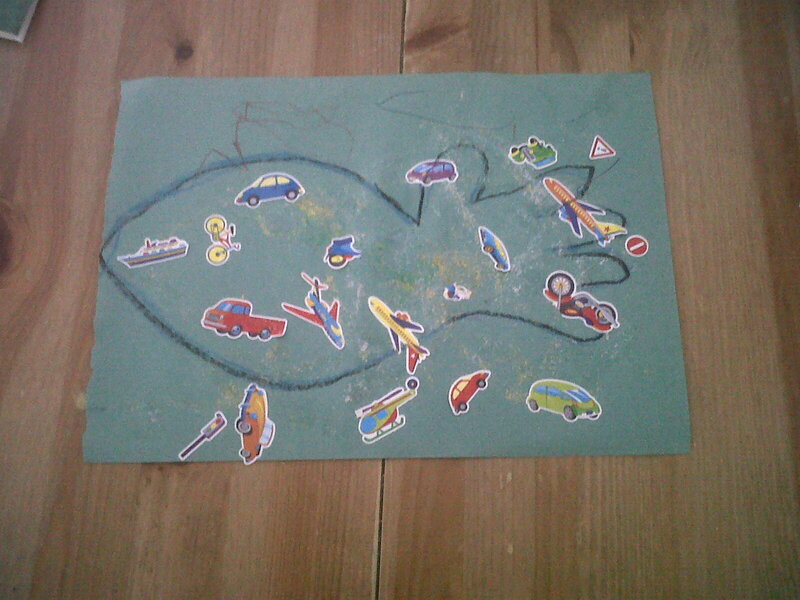 I drew around his hand then drew the rest of the fish and he decorated it using pens, glitter and stickers. He was so proud of it! Learning how to be responsible. 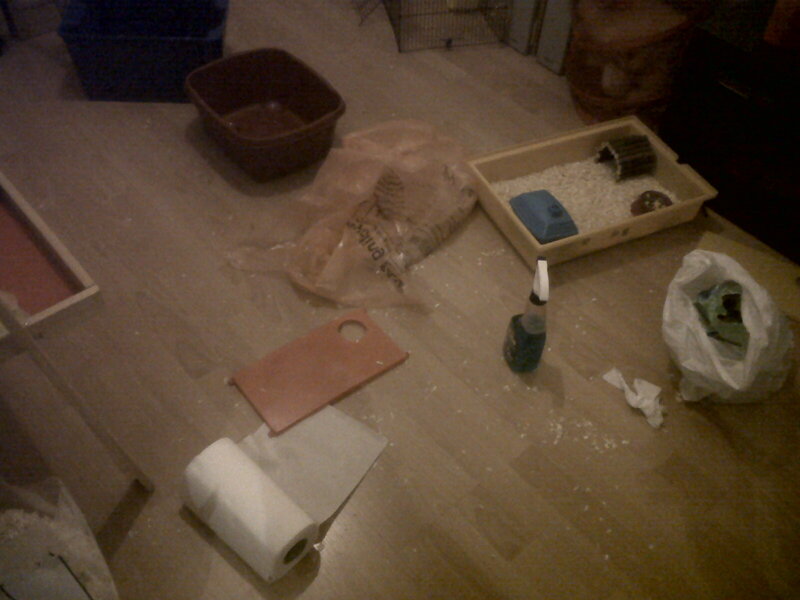 R cleaning the hamsters cage. 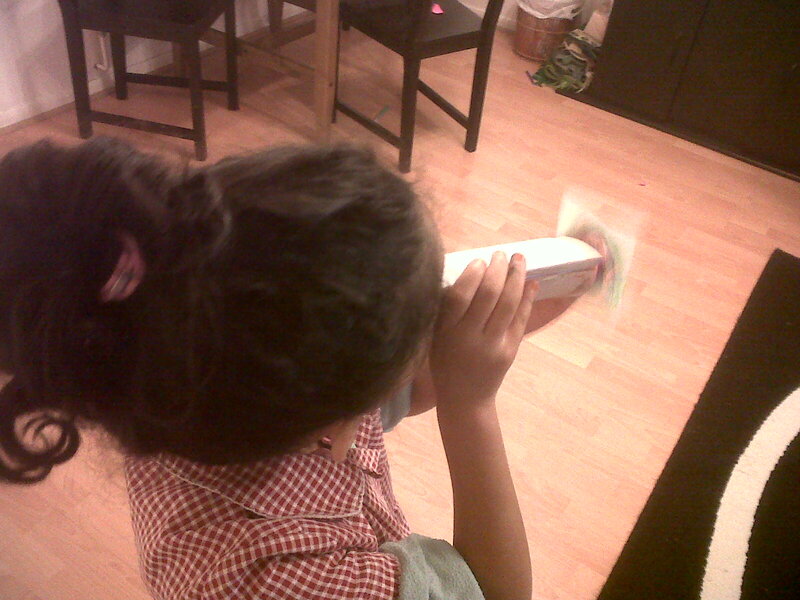 For science she made a kaleidoscope using card, tracing paper, transparent plasticand foil. It worked! 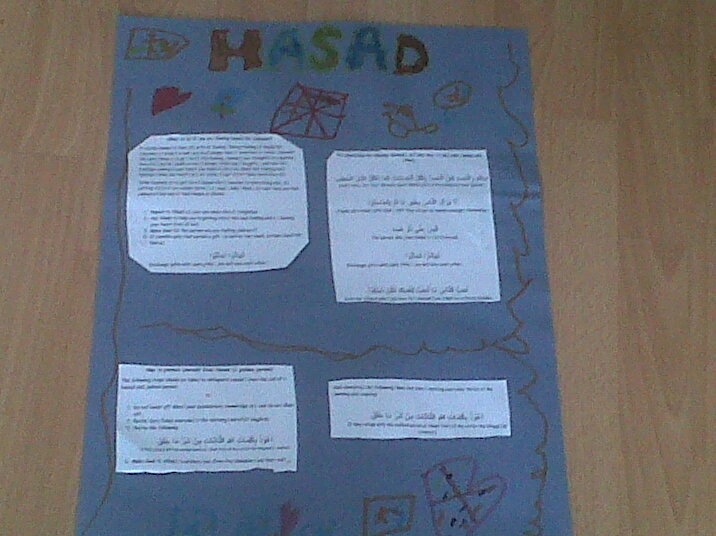 As part of our Quran curriculum, R made a poster about hasad. We also had quite a lengthy conversation about ayn and how to protect ourselves. Aside from this, I have really been trying to follow R’s interests. 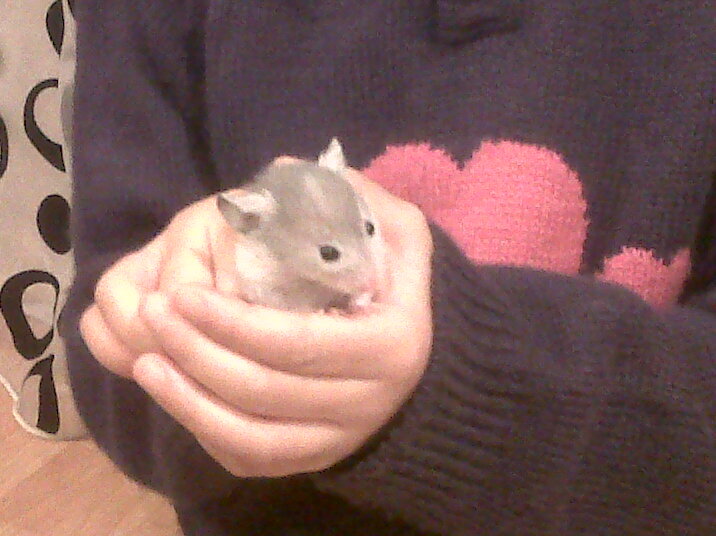 And the hamsters have proven to be a great asset in R leading her own learning. As a result of her new little friends, she took out 5 books about hamsters from the library and proceeded to read them in bits over the week. We couldn’t understand why they seem to sleep all day and then come alive at night. She was reading one of her books and screamed “Ummi! They’re nocturnal!” It was only earlier that very day that she learnt what that word meant as we read a book about night and day for our surah falaq project. She also learnt that they can be potty trained and what she needs to do daily and weekly to look after them. 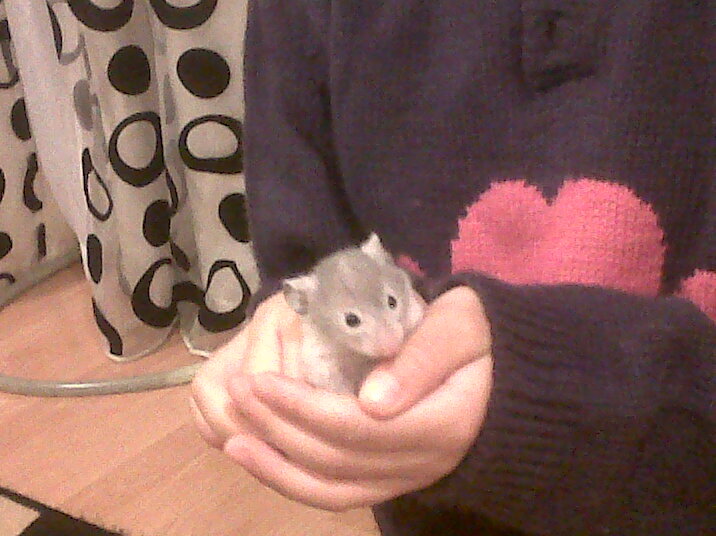 She also started a hamsters diary and wrote a few pages about her hamsters and their activities! All of this was self-led learning mashaAllah. Last 6 weeks and resources. We started formal home ed again after eid ul fitr and I really can’t believe 6 weeks have passed already! This week, we are on a much needed break. I have an assignment due on Thursday which I haven’t even started. Please make dua for me. I think I’m going to try and take a week’s break every 6 weeks or so inshaAllah. Although we are on a break, the learning doesn’t stop. I am keeping up Quran, Arabic and a few art projects for this week but everything will resume from next Monday inshaAllah. I have received some emails and comments on the blog asking me about resources that I use so I thought I would write a post about resources we have been using for the last 6 weeks. Please note, the list below are the books we use. We use a lot of hands on resources to support what we’re currently doing in our bookwork. Basically, there are 30 of these for the entire Quran. R now reads a few pages from Surah Baqarah daily, revises surahs she has already memorised and works on new hifdh. 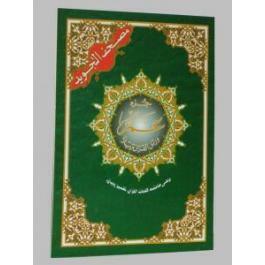 We recently bought the entire Quran in the green covered juz by juz. It is larger than the normal sized mushaf and as it is separated it into 30 juz, it is more manageable for smaller hands. The larger size has really made a difference for her reading alhamdulillah. Another great resource which has really aided R in her memorisation and revision is the Penman Quran which was actually mine but I gave to her. She uses this when we’re in the car and its good because ayat can be repeated again and again when she is working on her hifdh. She has also come to the end of this book. 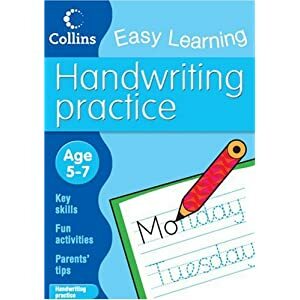 It introduces joined up handwriting. Alhamdulillah, this has given her a lot of confidence in her writing and when she does any independent writing, she joins up her letters. I have found that her handwriting is neater as a result of joining up. We only do a page of this a day (sometimes 2 pages) and subhanAllah, I have seen a huge difference in her handwriting just by doing a little every day. Once this is finished, we will be going on to some more handwriting books. I just think its all about practice practice practice. We have been using this book for spelling. We do this once a week and R completes a spelling test of ten words and a dictation exercise where she has to write down sentences that I read to her. R has been using this book to complete comprehension exercises. She is currently on lesson 61 of this grammar book. She really enjoys using this. We also use the above Jolly Phonics Grammar book for grammar as well. R is enjoying this. We currently do this twice a week. We are currently working thorugh http://www.altilmeedh.com/which has some really brilliant resources. We use a variety of resources for art including art blogs, books at home etc. We also signed up to http://www.naturedetectives.org.uk/club/ and sometimes do the weekly challenges they send to my email inbox and then R sticks a sticker on a huge poster they send you as she completes a challenge. As you know, this incorporates science, geo, history and art and I use a variety of resources for this. I read to R every day. At the moment it is normally a chapter from a book. R also reads a chapter to me every day. I try to give her books that are slightly above her level to push her a little bit. She goes to a kickboxing class for girls held in our local masjid. She also attends Muslim Beavers once a week. And we attend our beloved Thurs Home Ed group. I try to take her to the library once a week. She uses computer programmes such as educationcity.com and other sites. And is constantly making something with arts and crafts, engages in a lot of imaginative play either on her own (lol!) or with her brother. We try to visit home ed families and alhamdulillah she regularly sees a sister’s daughter who doesn’t live too far from us who is also home educated. She either comes to us or R goes to her for the morning or afternoon. Its nice because then I have some individual time with Z. Another sister has also started home educating who has a daughter R’s age and I think we might be seeing each other more regularly too inshaAllah. And I think that is about it!